The skate is a member of the ray family but is distinguished from most other members of that family in that they lack a tail barb or stinger. Skates are a kite shaped fish that have a flat body and two wings. The wings are the only part of the fish that is consumed. 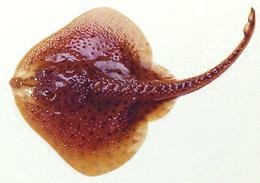 Skates give birth to fertilized eggs in an egg case. The case is often called a “mermaid’s purse.” The mother skate deposits egg cases, which have tendrils that anchor them to seaweed or rocks. The mother does not protect the egg cases during the 6-9 months that the skates develop in their cases. Skates develop slowly and can live as long as 50 years. Many species do not breed until after they’re eight years old. Skinning: Skate skin must be removed. It’s basically shark skin and shark skin is gritty with scales that are built more like teeth than like regular fish scales. They don’t scrape off. Male skates may also have some sharp spines out on the wings. Lay out your wing on the cutting board, thick side up. Pry up a corner of the skin at the thick corner and carefully scrape flesh away from the skin until the skin pulls clean without taking any flesh. The skin will now pull off, but takes some strength and it’s slippery, so grasp it with your long nose pliers and pull right off the thin edge. If you’ll be using the cartilage and/or the thin side meat, skin the thin side too. Cooking: Most recipes for skate call for it to be pan fried, though some call for poaching. In either case, keep in mind that the skate filet is not only thin but it’s deeply grooved, which allows fast heat penetration. Take care not to overcook, particularly when poaching or your fillet may fall apart on the corrugations. You can grill skate wings leaving the fin rays in and serve it that way. Use a rub or sauce suitable for grilled fish. Hearty eaters may eat it rays and all (depending on size), though the finicky may flake the meat off. Note that you’ll want to serve skate wings corrugated side up (the skin side), so you’ll want to fry that side first. When you turn the fillet over with the cut side down it will curl some toward that side. This will tend to emphasize the corrugations.